Over the years I’ve road-tested a number of products that help my bicycling more comfortable and more stylish. This list makes it easier for you to send very pointed hints to people who love you and want to make you happy with the perfect gift. In addition to being great products these items give you the chance to express values with your wallet. These woman-owned companies treat their employees well and think about their supply chain and environmental impact. Some also give back through donation of a portion of their profits. I’m a member of Team Nuu-Muu. So great for layering! Nuu-Muu: Get dressed. That’s their tagline and it’s great bike style advice. Ever since discovering these in a Bloomsday trade show booth in Spokane I have lived in them for all my errand-running bicycle trips, for leisure wear no matter what I’m doing, and definitely for cute coverage and easy layering on our long bike touring vacations. The Ruu-Muu and Scoop Pocket dresses have pockets in the back, like bike jerseys. Since they’re dresses I feel more covered up and fully dressed wearing them over bike shorts. They’re made in the US by a woman-owned company; pack like a dream; dry quickly; and flatter every body with their fabric selections. They donate to a number of causes. Wearing a Nuu-Muu makes you a member of a special club. I have had instantly comfortable conversations with total strangers because one of us says to the other, “I have that one. Aren’t they great?” They’re so popular that when a fabric sells out people go to the Nuu-Muu buy/sell/trade Facebook group to post a plea in case someone else wants to sell theirs off. 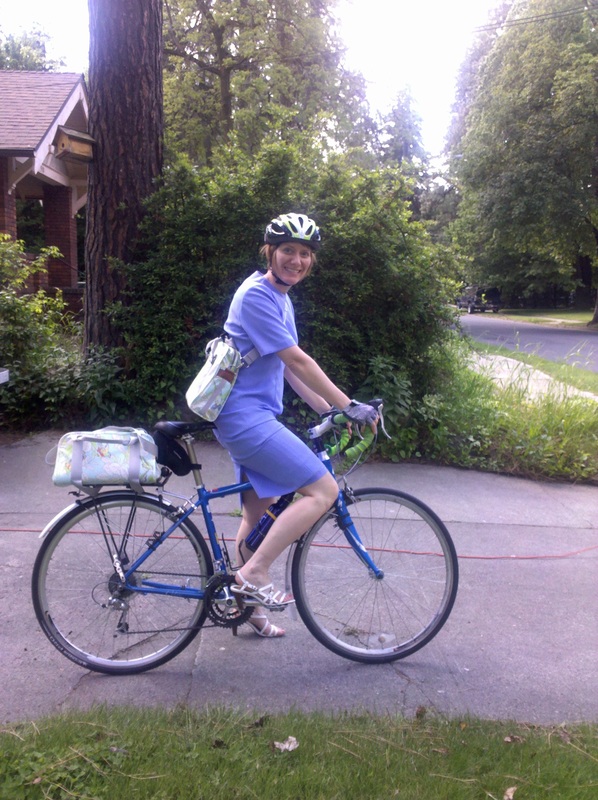 Total strangers in the bike lane will talk to me about my “cute bike dress–and it has pockets!” Read my review here. Dressed for the commute with a Po Campo bag. The dress-wearer in your life will thank you for a gift card. I guarantee it. 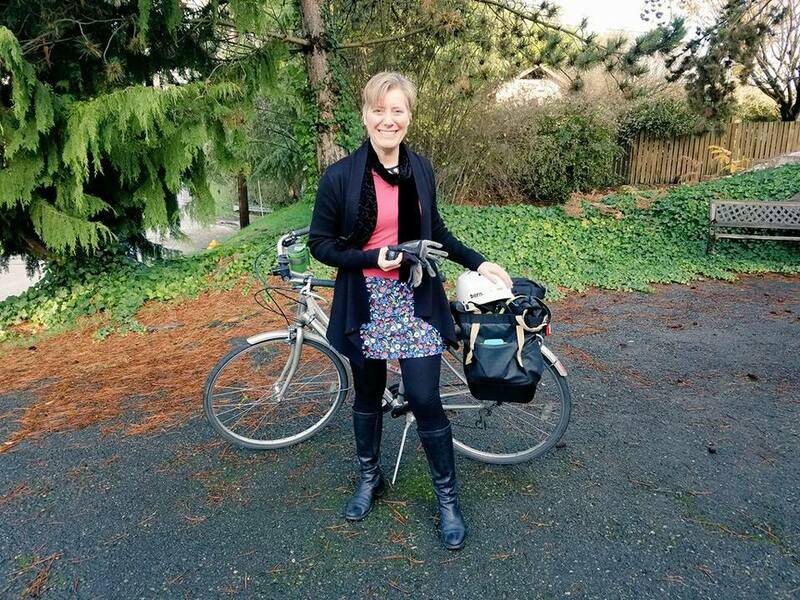 Po Campo: Founder Maria Boustead shared my frustration over all those black panniers with no interior pockets, no way to see anything once it drops into the bottomless pit, and those hooks that dig into your side when you carry the bag off the bike. 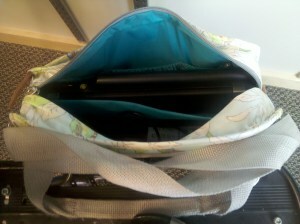 She took the principles of good purse design and applied them to vegan, water-resistant bike bags with reflective trim. Read my review of Po Campo bags here. Maria has made design changes since my review and the bags have gotten even better, with magnetic attachments in place of the snap/buckle set-up I wrote about. A portion of all sales goes to delivering bicycles to schoolgirls in rural Africa through a partnership with World Bicycle Relief. Learn more about Maria in her podcast interview with Arleigh Greenwald, Bike Shop Girl. Wander Wrap: This is my go-to for rainy days — a snap-on waterproof skirt that keeps my lap dry and doesn’t make my legs sweat the way rain pants would. Not just for bicycling either; this would be great for hiking in the woods through wet underbrush or walking your dog on a rainy day. Read my review here. What would you add? I mostly ride in regular clothes with a few simple adjustments to things like skirt design and fabric choices, but the right gear can make a difference. And who doesn’t love something cute? Next post: #BikeIt: What’s On Your List?